I know I've mentioned that I recently started working at a second job, but I don't think I've talked about what I've been doing. I'm working, a couple days a week, in the cosmetics/bodycare section of a local health food store. I figure, while I'm working semi dead -end, low-paying jobs in this "figuring out what to do next" stage of life, I may as well work somewhere where I can at least get behind most of the products. One of the perks, aside from being surrounded by lovely green beauty goodies, is that occasionally companies will send along a few extra products for staff to try, which is how I was introduced to this gem. Pretty is a brand I've consistently heard good things about, but never before tried for myself. The company was founded on the principle that "less is more" when it comes to your skin, and their products, contain only pure, natural ingredients. The line is free of the regular nasties like parabens, petrochemicals, and silicones and as an added bonus, they're also a local-to-me company, based right here in Toronto. The facial cleansing grains are a dry powder, that when mixed with water (or another liquid) transform into a slightly gritty, milky cleanser. Pretty makes three types, all of which start with a base of oats and kaolin clay, with varying additions to suit different skin types. 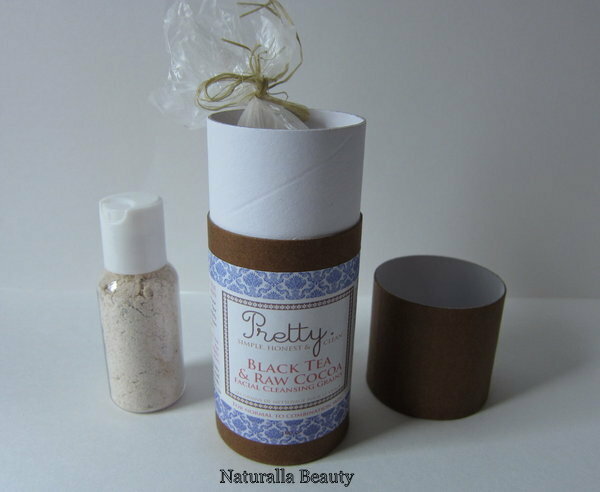 The Black Tea & Raw Cocoa grains are recommended for normal to combination skin and contain black tea and raw cocoa powder (obviously), as well as tiger lily flowers and orange and spearmint essential oils. I've been enjoying using this product as a gentle morning cleanser. 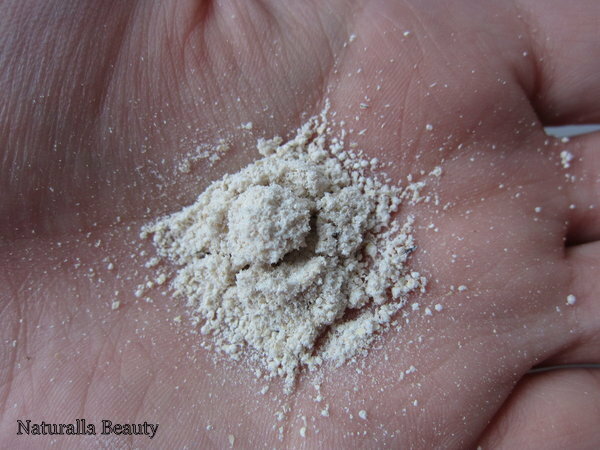 The grains do a great job removing any dirt and impurities and they're the complete opposite of stripping to your skin. The predominant scent is spearmint and the grains feel slightly cooling on my face, which has been especially lovely in the sticky, humid weather we've been having lately. After cleansing, my skin is left feeling soothed, incredibly soft, and even slightly plumped and hydrated. I love the look of Pretty's signature cardboard tubes, but having the cleansing grains in just a plastic bag inside the tube isn't great in terms of practicality, so I've transferred some of mine into a small, plastic travel bottle. It's been working really well, since I can easily pour out what I need without having to be concerned about contaminating or wetting the rest. Also for the sake of convenience, I've started mixing the grains with my George's Always Active Aloe, since the spray top makes it super easy to wet the grains just enough, without drowning them or losing any down the sink. I imagine they would also be lovely mixed with a hydrosol or floral water, if you felt so inclined. Pretty's cleansing grains are affordably priced and I only use about 3/4 tsp each time, so I'm expecting they will last me a good while. I'm not sure they would be the best cleanser to take on a full face of makeup, but they're perfect for a morning cleanse, when you're just looking to refresh your skin and wash off any sweat or oil that may have accumulated during the night. I'd definitely recommend them to anyone looking for a gentle cleanser that effectively cleans your face without drying or stripping your skin. Ingredients: Organic oats, kaolin clay, orange oil, spearmint oil, organic raw cocoa powder, tiger lily flowers, black tea powder. Disclosure: I received this product for free, but I was under no obligation to write about it. Pretty does not know who I am, let alone that I have a blog. Ohhhh la la, a health food store?! I'm so jealous. I can only think of a few that carry that line. This was a great review! You must try their masks & floral waters, just beautiful. Thanks! I have one of their moisturizers here also, but I'm trying to use up other stuff first :) Their masks and floral waters look fantastic too! Thanks for the great tip about using toners or hydrosols to mix cleansing grains. I never thought of that! That's a much easier way of wetting the grains than my normal way, which is just to pour small amounts of water into my hand directly from a faucet or small cup. I suppose I could also just use plain water in a spray bottle, but I like the idea of occasionally getting the extra benefits of the toner, too. I've been interested in cleansing grains but haven't tried them before. I'd love to mix some with some Heritage rosewater with glycerine I have since it comes in a spray bottle. I'll have to try some out sometime. 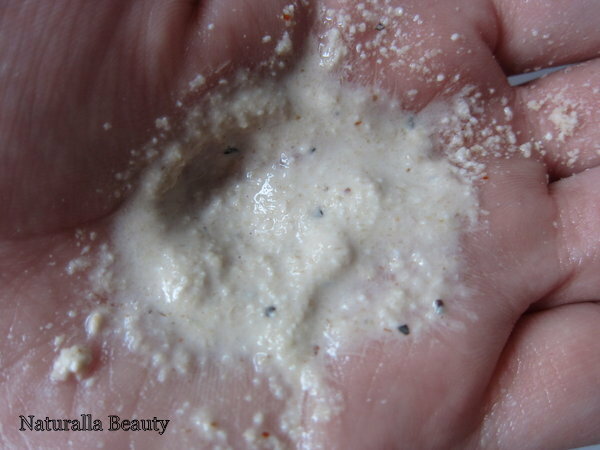 This was my first experience using cleansing grains too! I always sorta thought having to mix/wet them would be a hassle, but it's actually easy enough and only takes a minute :) Rosewater and glycerin sounds like it would be great to mix with them! Very nice review! I only tried Dermatologica cleansing grains...and i really like the effect! Will check a bit more on "Pretty" website. Pretty is so great!!! Love the line! !